Stanley Spencer Gallery goes live! iMuse partner, the Stanley Spencer Gallery, Cookham, has gone live today with its first AACT iPad installed for visitor use. Chrissy Rosentahl, volunteer and project lead in the Gallery, ruminates on the practicalities of using a shared iPad in real life. We launched today in the Gallery …. Valentine’s Day! Much love…. I have spent more hours cutting up tennis balls, sticking Velcro to the floor, unsticking Velcro from the floor and scratching my head about security than I have spent sorting out content – but I suppose that’s point of the exercise. Working with iMuse has been great – because it has inpsired us and motivated us to use the iPads in the Gallery to deliver extra content. Now we have to see if we have delivered something our visitors actually want. I have just been training today’s Custodian to unplug and wake up the iPad and to enable Guided Access. That has not been without its problems. For fingers unused to touch screen ‘click the Home Button three times’ is not as simple as it sounds…. Do you do it with a finger nail slowly, with the pad of the finger quickly…?? It depends….. I have written instructions – which are probably more confusing then necessary as I have tried to cover all possible problems – so it’s back to the drawing board on that – I have left the Custodian in the Gallery with the feedback forms (simple) and their first visitor (a woman in her 70’s) – who immediately showed interest and picked it up…. iMuse is part of the Arts Council England World Stories project in the Ure Museum of Greek Archaeology. Working with a student panel, 14-16 year-olds from three schools, Guja Bandini, the Museum's education officer, and professional animator Steve Simons, iMuse is tasked with providing an iPad app. This will bring together material the project produces, interpreting myths in a fun and engaging way based on an object within each display case. 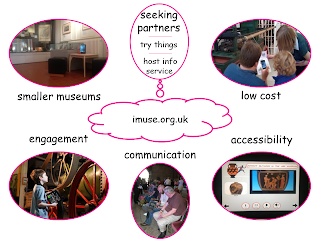 The overall Project is about young people engaging with the objects in novel ways with iMuse having a particular interest in ensuring accessibility/inclusion are considered. Having an app is a means to an end, not a primary aim, so we'd agreed to use the mini web app previously tried in both the Museum of English Rural Life and the Ure. This was initially designed for use with QR codes on object labels, with a simple, layered interface using symbols and only a modicum of text. In the Ure, this could be used alongside a printed map. While the interface did seem to provide a reasonably accessible way into finding out about objects (http://www.emeraldinsight.com/journals.htm?articleid=17068126&ini=aob), several things have set us experimenting again. So, we've stepped away from mimicking the old ways (buttons looking like you are controlling something like a cassette recorder). Instead we are experimenting with an interface which has no written text initially, but has photos of the actual display cases to help orientation. Sophie as the cursor/guide, following the visitor's finger, flies past these, settling on an object when requested. The visitor decides which bits of info they want to look at and can easily 'fly back/forward' to other cabinets. It's not sensible to decide the exact interface until we know what material is going to be provided, but already we have some good ideas coming in about highlighting objects, having audio/visual 'pop-up instructions, and ensuring any text-based items have audio versions, and any visual items have audio descriptions. There's masses to think about here, with potential for more use of the media such as signing or captions on video. There are also practical considerations, not least iMuse's very limited technical coding ability and our requirement that this remains a web-type rather than native app. The good thing is there is time for us all to discuss the possibilities and to do some trialling before the launch in early Summer. All comments about the interface welcome. Following her post on the Stanley Spencer Gallery, Chrissy Rosenthal introduces the Gallery's iMuse project. Ann Danks, our gallery archivist, spotted a talk that Annette Haworth of AACT was giving at Reading about the iMuse work at the Museum of English Rural Life and we decided it sounded intriguing. The use, and future use of IT in the gallery was something that needed addressing. We do not have a resident IT geek on our staff list. One member looks after the Gallery plant and till software, one runs the website and I am involved in creating presentations and illustrated talks using archive material - but we don't have an overall strategy or IT guru to be definitive about our requirements. As volunteers we have to play to the strengths of the skill base available - and I'm afraid we don't have the geeky ten year old on staff yet who can tell us instantly what we need and how we do it - so we are feeling our way slowly. This is why the iMuse project is so important to the Gallery. It opens up for us not only access to the iPad technology - for which we immediately came up with four or five uses - which we could not readily afford ourselves - but just as important is the skill base and the experience they have already gained. We now have back up and assistance as we pick our way through the minefield. Working with Annette we have accepted the challenge of a six month experiment to see if we can create a sustainable way of using technology to engage visitors of all levels of ability and to add to their experience in the Gallery. We have identified a long list of challenges - and are working on the solutions. Twitter can wait while we deal face to face with our visitors. They are a complete cross section - about a third 'concessions' i.e.over 60 - a third 'adults' and the rest students and under 16's, mainly with school parties. We are accredited to the Museums Association so we have certain obligations ( which we would feel even without this official requirement) to those with special needs and are already working towards offering enhanced services. My next blog will cover the challenges we face and how we go about meeting them. Chrissy Rosenthal, co-lead in our latest project, introduces the Stanley Spencer Gallery. The SSG is a small but beautifully formed art gallery housed in a converted Wesleyan chapel in Cookham, Berkshire. That statement doesn't do justice to the importance of this vital institution devoted as it is to one of Britain's foremost artists. Sir Stanley Spencer RA (1891 -1959) was the YBA of the first half of the 20th century - a very individual visionary artist with a wide oeuvre of work. He was prolific - creating over 450 oils and thousands of delicate and beautifully crafted and observed drawings. For Spencer each creation contained elements of himself, and his desire to join together the secular and the divine - what he called his 'up there and down here' feelings. A graduate of the Slade School of Art he was the stand out pupil of his year group, which included such luminaries as Christopher Nevinson, Mark Gertler, Paul Nash, David Bomberg and Dora Carrington. He had the distinction of being an official war artist for both world wars. He became an early victim of the celebrity culture because of his honestly felt and naive attitude to the women in his life - married to Hilda, the mother of his two children, but infatuated by the lesbian Patricia. Following a divorce he married Patricia, only to be left virtually destitute and impoverished financially after he professed to wanting both women in his life, and being labelled as the man who wanted two wives. The Sunday Express of 1937 was outraged and public opinion scandalised. He was however much loved, if not always understood, by the community of his native Cookham and the Gallery was opened just three years after his death as a place not only to house a collection of his work, but as a lasting memorial to their local genius. It is now, 50 years on, an institution of national importance as a centre for Spencer studies, and a destination for international art lovers. A look in the visitors book will show scholars and enthusiasts from around the globe. Perhaps one of the most remarkable things about this institution, which on average welcomes more than 15,000 visitors a year, is that it is run totally by volunteers. Actually that is not quite true - a cleaner is paid to come in once a week. Today a team of about 50 do everything from organising exhibitions of loan paintings from other galleries and private owners, commissioning the printing of postcards and framed prints, collate archives, host conferences and lectures, run education and access programmes as well as maintain the building, plant and security. All this is done on a self financing model - with only occasional and very recent assistance from outside bodies. In 2006 Heritage Lottery Funding enabled a complete overhaul of the building and the old chapel became a beautiful 21st century gallery space. One special exhibition was assisted with grant money from the Foyle Foundation and recently small grants have allowed two important education projects to employ specialist practitioners to involve local school groups. Chrissy's next post introduces the Gallery's iMuse project. This is a tentative post because there are complex issues surrounding copyright which iMuse would not claim to have grasped fully. BUT, looking back on what we've done over the last few months, and are currently planning in the three museums/galleries we're working with at the moment, it seems we are being driven at least partly by copyright issues. The primary iMuse 'idea' is that smaller museums might be able to help visitors engage more, and get better accessibility, by using their own mobile equipment - especially smartphones, and increasingly, tablets. However, in each site so far we've encountered copyright problems that mean material can be used in-gallery but not outside. This means publishing openly via the web is ruled out, so the simplistic (sounding) 'put your material on the web and show visitors how to access it on their phone' or 'don't write (or pay for) posh native apps - do simple web apps with a bit of HTML5 etc' becomes impossible if you want to use some in-house material. And this doesn't just apply to images of objects, but in some cases to text. Even the text of in-gallery labels was so heavily copyrighted that in one museum iMuse was not allowed to demonstrate how an iPad could help by blowing the text up. In another, although the artist had been dead for 2.5 thousand years, visitors were not allowed to take photos of a loaned pot as 'ownership' rested elsewhere. Thus copyright is working against accessibility. What to do? Well, we need to think more than we already have on this issue and work on it right from the start in projects. What has actually happened, rather subtly, is that iMuse is falling back more and more on the rather old-fashioned model of the museum providing the equipment for the visitor. There are some pluses to this approach of course. We have complete control over the interface, and while at this experimental stage, can afford to loan one or two high-resolution iPads to the museums. However, this approach doesn't scale or encompass the generality of devices that visitors will increasingly bring along. For example, we have implemented 'mini apps' using the Kiosk Pro app as the 'host' on iPads. This works pretty well, getting over other problems, particularly patchy or non-visitor centred wi-fi. BUT this app is iPad specific. We are subtly getting further sucked-into the Apple ecosystem by using other special features too - the Guided Access mode is one and using iBooks Author in a gallery which has existing Mac experience is another. Have others already studied (and resolved...) 'copyright as an accessibility issue?'. Copyright is not iMuse's area of expertise - we need help! trying-out low cost ways of engaging visitors via smart phones and/or iPads etc? or thinking about it but worried by the potential financial implications? would you like to explore further? or is it already being done? (AACT is a tiny volunteer-run charity currently managing the iMuse Programme). iMuse where have we got to? At the start of 2012, we adopted some 'principles' - a rather grand name for a list of things we were trying to do and how. It's somewhat past time to have look back to see where we are and whether we've stuck to these or think they should be altered. We aim to help moderate size museums become more accessible by using mobile devices. By 'moderate size' we meant museums which don't have there own IT teams or large budgets (average app apparently costs ~£30,000) for software development, but which do have some effort - whether staff or volunteer - to put into creating some mobile device-based museum experiences. By 'mobile devices' we meant those that are now consumer, high-street, web-enabled devices (iPads and similar tablets and smartphones). It was pointed out that other, more specialised, mobile devices (such as Voca) might be included, but we have not done that specifically. We have tested several things in and around two 'moderate sized' museums: the Museum of English Rural Life and latterly, the Ure Museum of Greek Archaeology. Have we helped them become more accessible? Not yet on a sustained basis. Yes, we have done this, with more than a dozen activities tried out, and iteration, particularly in relation to the use of QR codes and symbolised labels. Yes, we have done this, with lots of people trying our various activities. However, there have been very few trials where we have known for certain that a visitor has a particular disability or none. Most of the activities have been by mixed family groups with us participant-observing rather than formally set up, controlled sessions. almost everything we have done is driven through the web so could be accessed using visitors' own phones/tablets. 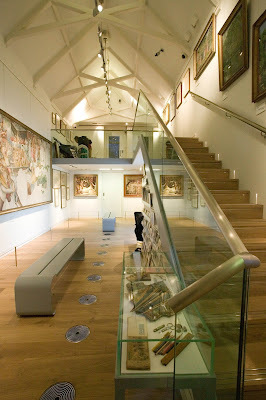 BUT we have done almost no design specifically for visitors' phones and, while some logs show visitors' using their own phones in the MERL, there has not been any sustained info available about how to connect to the in-gallery wi-fi or any handouts on what is available. Much of what we've tried has been on our iPads loaned to visitors during special events (such as half-term family activities). So far, the only real experiments on this have been with a few young people, where we found involving them in creating content by taking photos and videos did seem to increase engagement greatly. We are, early in 2013, part of an ACE project, Stories of the World, where 3 schools (one a special school,14/15 year olds) will create content based on myths and objects in the Ure Museum. -possibly better to use photos [rather than symbols] as interface. We have iterated quite a bit on the symbol/QR code/label combinations - cutting down the use of more 'abstract' symbols considerably. The tethered iPad-on-a-box on a trolley did enable more to join in some trails (it helped: child in wheelchair, learning disabled group [who chose to re-view and re-view a video], young person using walking frame with poor hand coordination, people who find iPad too heavy, got round difficulties of aligning device on a code, people with VI). We have adopted a layered approach to access to information, starting with the label and going through other levels through scanning and key-on-screen taps so that visitors of different abilities can choose what they look at/hear. We managed to get some analysis of the QR code use done (note coming out in Journal of Assistive Technologies, in print). Most recently, the text-free Ladybird book (an iPad bound to look like a Ladybird book, with the original artwork pictures and sounds associated with tapping the animals etc) has proved enormously popular with visitors of all types. So,on the face of it, we seem to have followed the principles more or less. BUT where does this leave iMuse? It needs to find a way to encourage museums to become 'mobile device' friendly. Trying fun things out in a couple of museums does not lead to anything sustainable. We are looking for ways to encourage others to try things, for example by setting up an advisory service in partnership with other organisations.